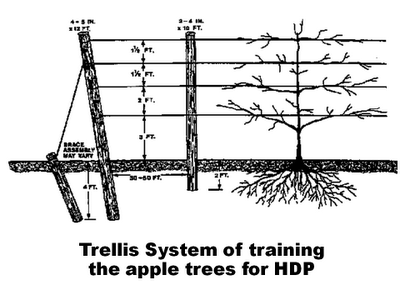 This post is in continuation of the previous post on Training Systems in Intensive Apple Cultivation: Trellis. 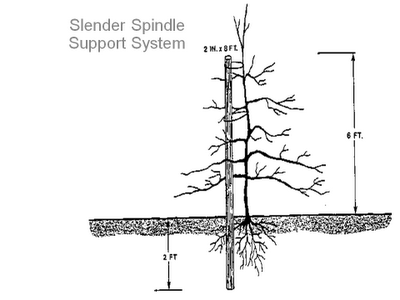 This post explains about the Slender Spindle training system further modification of spindle bush training system. This is the system preferred by growers who wish to work exclusively from the ground and are not confident in building wire support systems. The slender spindle (SS) consists of an individual support post at every tree. The post should be 2.4 - 3 m in length and of pressure-treated wood, concrete or metal to ensure it lasts the life of the orchard (perhaps 12 - 18 years). A diameter of 4 - 6 cm is preferred, since risk of frost heaving increases with larger diameters. The depth of the post in the ground should be 60 - 90 cm for stability leaving 1.5 to 2.5 m above ground. A common mistake is to have insufficient post height above ground. The tree is trained to a slender bell, or pear shape with the bottom whirl of branches acting as a permanent fruiting table. The leader and top of the tree is kept quite weak to contain height. Renewal pruning of mature trees consists mainly of removing 2 - 3 of the largest diameter branches on an annual basis during the dormant season. Tree height does not exceed 2 - 2.5 m.
In the next post I shall be discussing about the Vertical Axis or French Axis training system. This system is followed mainly in France having average productivity of about 42 Tonnes per Ha. 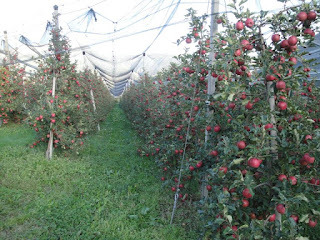 This is in continuation to my previous blog on Training Systems of Apple Trees in Intensive Orchards where I mentioned about three basic training systems of apple trees in intensive cropping i.e. high density apple plantations. Today I am going to discuss about trellis. 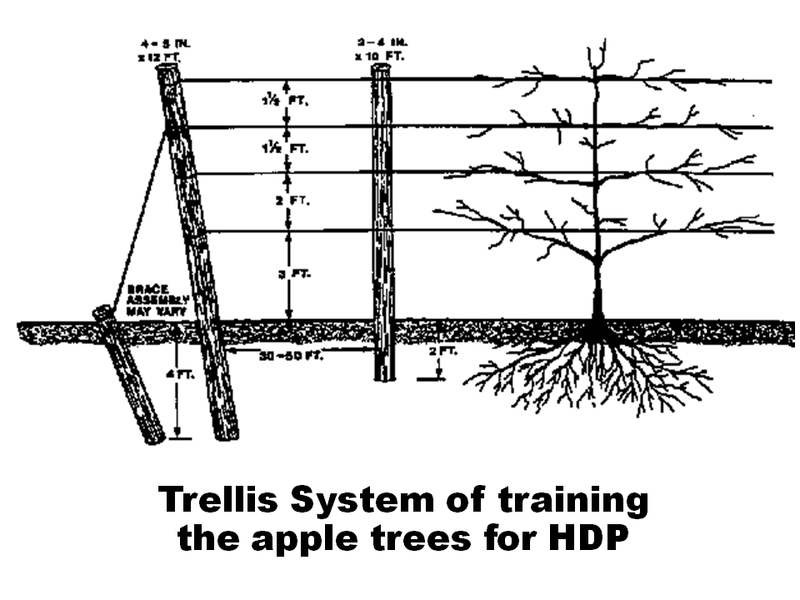 Why trellis or any other support system based training system should be adopted for the HDP on clonal rootstocks. As you are now aware of the fact that the production can be optimized by harvesting 70 per cent of available light. Further the wood produced and fruit produced ratios are to be optimized. Why we produce wood? Wood is produced for structural strength. This is the reason for growing larger trees on strong scaffolds. If we want to grow HDP we must understand that support system is necessary to reduce wood production. This helps us in growing the trees with more fruiting wood than the structural wood. Therefore the production can be started at early stage of the plant/ orchard life. If the production can be taken as early as two to three years of planting, the breakeven point of orchard establishment can be met earlier. The system basically consists of one or more high tensile steel wire(s) drawn tight and supported 2 - 3 m above the ground by a series of in-line posts spaced 6 to 10 m apart. The closer the spacing for the inline posts, the higher the degree of stability of the support system under strong wind or high crop load conditions. The trellis support system is somewhat more complex than the Slender spindle and vertical axis to install. It does require a high level of skill to build the support system and be sure it is adequate to hold the trees and crop load. A post failure in this system can result in the loss of several trees. The standard anchoring system now in use is the "auger anchor" which is screwed into place. Posts are generally pounded or watered (water gun) into the ground. The key problems of trellis systems are varieties with excessive vigorous or strong rootstocks that result in excessive pruning to contain the tree. Also, trellis systems support the total weight of the crop load and, as a result, must be exceptionally sturdy with posts for wire support located every few trees in the row. In coming posts I shall be discussing about Slender spindle, Vertical Axis and Super Spindle training systems. The number of apple trees per acre in new orchards has gradually been increasing. Orchard intensification is motivated by the desire to produce fruit early in the life of the orchard to rapidly recover establishment costs. 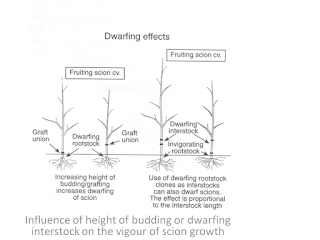 Intensification is possible by using dwarfing rootstocks that control tree size, induce early cropping, and produce large quantities of fruit relative to the amount of wood produced. Apple trees grown on dwarfing rootstocks have shallow or brittle roots systems and trees grew poorly and often leaned or fell over. Therefore these plants require support systems. However, Intensive orchard systems are more profitable than traditional low-density orchards on semi-dwarfing rootstocks. However, because the establishment costs for intensive orchards are high, trees must be trained and pruned properly to induce and maintain high yields. 2.) reduced pruning and harvest costs of mature orchards. Yield is positively related to the amount of sunlight intercepted per acre. Profit, which is influenced by yield as well as fruit size and quality, is probably at an optimum when an orchard intercepts about 70% of the available light. Traditional orchards, using vigorous rootstocks, were typically planted at a spacing of about 22 feet x 16 feet with 132 trees per acre. For the first five or six years after planting, fruiting was discouraged to promote vegetative growth so trees would fill their space as rapidly as possible. The first crop was usually harvested four or five years after planting, but high yields were not obtained until trees finally occupied their allotted space. Maximum yields did not occur until about 12 to 14 years after planting. Intensive orchards are typically planted at narrow spacing depending upon the training system adopted but one thing is very clear that a small crop is often harvested the year after planting, because trees have so little space to fill, peak production is usually achieved during the 6th or 7th year after planting. Once trees fill their allotted space, maximum yields are similar for all types of orchard systems. Because the primary advantage of intensive orchards is early fruit production, these orchards should be planted only on excellent sites with a low probability of crop loss due to frost or hail. 3. "Vertical axis or French Axis." 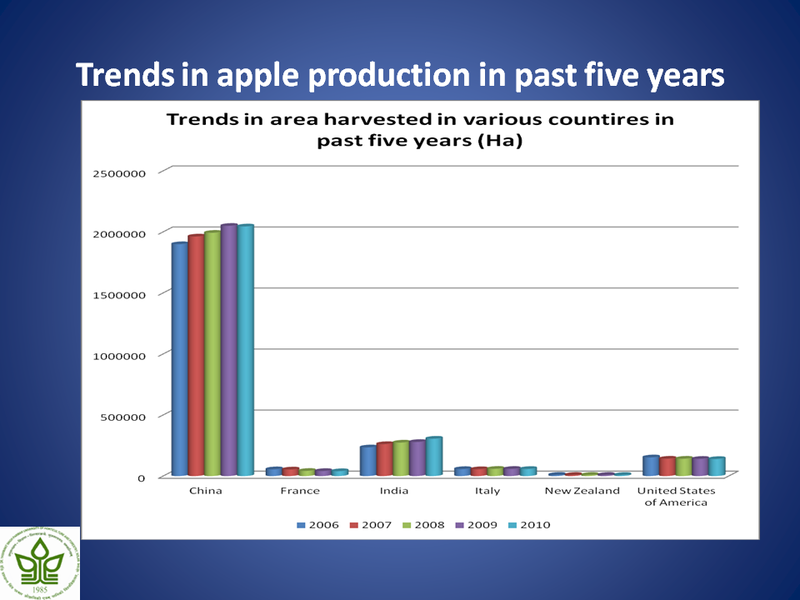 High Density Apple Plantations: Why? In my previous blogs I discussed about high density plantation and rootstocks, clonal rootstocks. Though I have written about the productivity, but farmers must understand what does this productivity means? For this purpose I tried to compare the area harvested, production and yield for 2006 to 2010 (five years) for six countries Viz. China, France, India, Italy, New Zealand and USA. Graphs prepared for visualizing the impact of high productivity. You can go through these graphs and then decide why HDP is necessary? The data was obtained from www.fao.org (FAOSTAT). The data presented above indicates that India possesses second largest acrage under apple plants among the six countries compared, where as Italy possesses only one sixth of its acrage but when production is compared with, India and Italy has at par production. France shows maximum productivity and India shows lowest productivity. Further our orchards are becoming old and senile that warrents us to move with a planing and that too we have to face replant. We have only one option if we want to maintain our production or enhance the production and quality i.e. HDP. In coming posts I shall be discussing about training systems for HDP Apple. This post is in continuation to my previous post on High Density Plantation: Advantages of smaller trees. Rootstock is the root system and a small proportion of the lower trunk of most apple trees. Grafting the genetically distinct fruiting part of the tree, the scion, on the rootstock forms whole tree. Occasionally a third genetically distinct component, an interstock or interstem, is grafted between rootstock and scion. Its really difficult to propagate the scions directly, but the rootstocks can be propagated easily that’s why rootstocks are used in apple propagation whether seedling or clonal rootstocks. Next question comes to the mind that why clonal rootstocks when seedling rootstocks are available and are propagated easily. 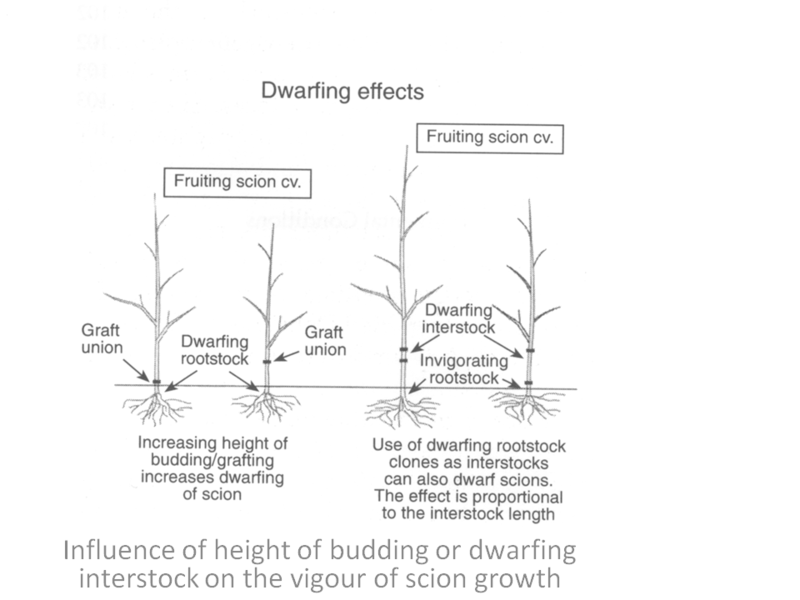 Its true that seedling rootstocks can be propagated easily but these vary in genetic make up because its a sexual propagule, therefore it is bound to produce a different reaction to the scion. This means that you can not expect the plant to produce the same quality as of the parent. Whereas the clonal rootstock is produced through vegetative means thus have same genetic print that gives assurance that reaction to the scion will be the same that means there is most likely same quality of the plants and fruits can be produced. I discussed about Trichoderma with respect to its role in plant health management. In my previous posts I have discussed about low productivity in apple especially in our perspective. This low productivity in Himachal is because of many reasons discussed in previous posts that are to be dealt with technological back up. This requires lot of motivation of the farmers to adopt high density plantation on clonal rootstock but with this there is a great need for the technologocal backstoping. 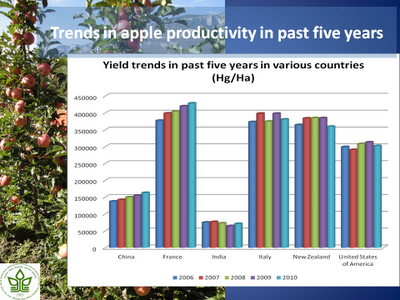 My core feeling is that what ever we are producing is not enough since if we check out the production data of our state it is hardly touching 11 T per hectare that too once or twice in the histroy of apple production but if we check out the average then it is hardly 4.5 T per hectare. Whereas countries like NewZea Land and Italy producing fruit to a tune of 40 T per hectare this makes us to review our strategies and to findout the way to increase our production. There are some farmers who are doing a very good Job in this regard they are trying to develop there own system to keep pace with the industry of apple production among these I must mention here that Mr. Vikram Singh Rawat in Karsog Valley is putting all his efforts to produce the trees on clonal rootstocks further he is putting lot of efforts in bringing the farmers under the umbrella of organic farming and high density plantation. In this series I feel that it is important to mention the name of Mr. Rajesh Thakur of Mahog, Mr. Rajender Kaushal of Chamanpur, Mr. Arun Bansal of Ruhni, Mr. Diljeet Singh Ghumman of Bakhrot, besides Mr. Dinesh Primta of Chaupal area, Mr. Neetu Dharma of Kotgarh and Rajender Chauhan of Kotkhai are the one those are working hard to make this high density apple plantation a reallity. This is a list where I know these farmers either personnaly or through my close connections. Many other farmers involved in the high density plantation this situation warrents us that we must put our steps forward to support these farmers in achieving their endeavours. That was the reason to bring out this topic ahead of disease and pest management in apple that was in planning well before persuing this blog. Apart from the direct inhibition of plant pathogens, Trichoderma spp. are reported to improve crop health by promotion of plant growth (both root an shoot). It is reported to enhance growth in a number of plant species like rice, wheat, sorghum, tomato, brinjal, soybean, chickpea, pea, rajma, chilli, capsicum, apple etc. However, this growth promotary effect was not only dependent on isolate of Trichoderma but also on plant species cultivar involved. Plant growth promotion is one of the indirect mechanisms employed by Trichoderma spp. which plays a role in the biocontrol of various plant pathogens and in improvement of plant health. Treatment with Trichoderma generally increases root and shoot growth, reduces the activity of deleterious microorganisms in the rhizosphere of plants and improves the nutrient status of the plant. Growth enhancement by Trichoderma spp. has been observed even in the absence of any detectable disease and in sterile soil and is not considered to be a side effect of suppression of disease or minor plant pathogens. Secretion of hormone-like metabolites and release of nutrients from soil or organic matter, have been proposed as the mechanisms involved in plant growth promotion. Trichoderma harzianum is good solubilizer of phosphorus but different strains show wide variation in their ability to solubilize phosphorus. T. harzianum was also reported to solubilize MnO2, metallic zinc, and rock phosphate (mostly calcium phosphate) in a liquid sucrose-yeast extract medium. Trichoderma produced chelating metabolites and used redox activity for solubilizing the minerals. Both of these mechanisms also play a role in biocontrol of plant pathogens, and they may be part of a multiple-component action exerted by Trichoderma to achieve effective biocontrol under a variety of environmental conditions. It has observed that seed treatment of corn with T. harzianum, planted in low nitrogen soil resulted in plants that were greener and larger in the early part of the growing season. An increase in the microelement content (viz. Cu, P, Fe, Zn, Mn and Na) of plants was also observed. Symbiotic colonization of roots by Trichoderma enhanced root growth, which may be responsible for increased tolerance of plans to biotic and abiotic stresses. Wheat plants raised from Trichoderma treated seeds tolerate drought (water stress) better under field condition. 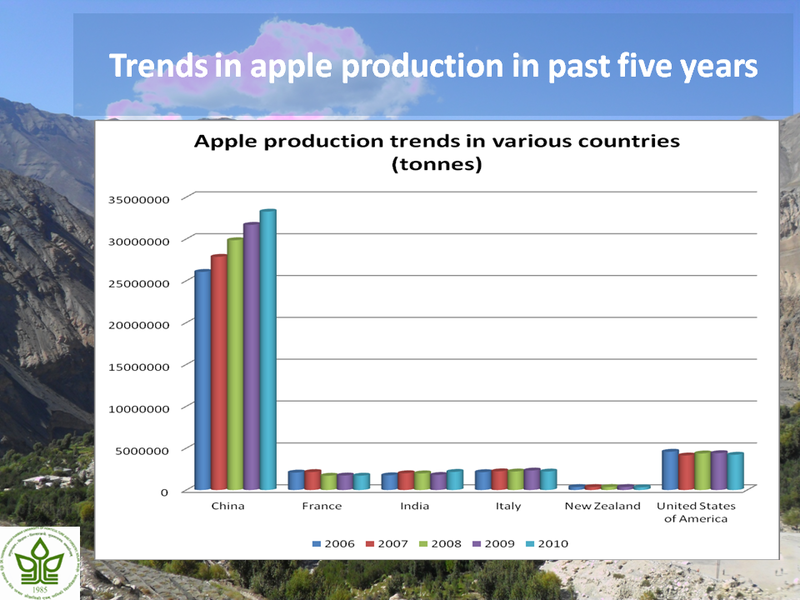 In coming posts I shall be discussing on Apple production with respect to future perspective in Himachal Pradesh and High Density Plantation.